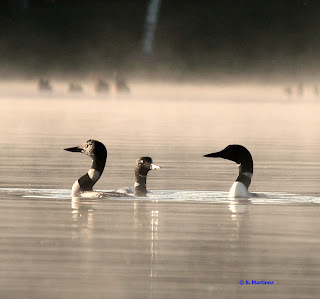 For the most recent updates and Loon information, please visit our sister site: michiganloonwatch.blogspot.com. Please find the link on the sidebar. 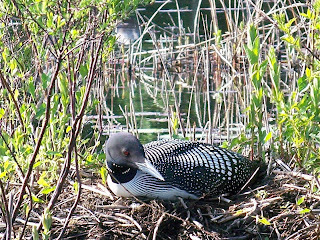 Friday, March 19, 2010: We have received our first word of a loon pair Spring sighting! They arrived on their territorial Mecosta County lake as soon as the ice was off. We're happy to start welcoming our Michigan loons back home! New Issue of "Loon Echoes" Just Out! March 16, 2010: Our latest issue of our Loon Echoes quarterly newsletter is just off the press and is on its way to our members and friends! This is our annual membership issue, and features a timely and thought-provoking article by Ranger Steve Mueller, as well as a great loon rescue story by Ross & Rose Ann Powers, another of Auntie Arloon's informative answers to a reader query, literary reviews by our resident Looney Bookworm and our latest Loon Mercantile catalog, among other special features and pages. We would be happy to send a copy to any of our Friends of the Loon out there who are not yet on our mailing list; and would welcome your membership or donation. Membership opportunities begin at just $10, and include a year of Loon Echoes, an MLPA decal, and updates about loons throughout the year. Best of all is knowing that your contribution goes a long way in helping MLPA and Michigan Loonwatch with our work in fulfilling our mission: to protect and preserve one of Michigan's most exquisite species, the Common Loon, and its critical habitat, our beautiful Michigan lakes. To request a copy of Loon Echoes, and to become a friend or member of MLPA-MLW and the Common Loon, please contact Joanne at michiganloons@yahoo.com or Luanne at jaruzel.tds.net, or call Joanne at Loon Central: 989-828-6019. Thank you; and happy springtime Loon-watching as our birds begin to return home to their northern territorial lakes! Loon Ranger Spring Packets: Mid-to-Late winter is the time that we begin to prepare for Spring and the long-awaited arrival of the loons. Right now, the Loon Ranger Spring Packets are being prepared and will be sent out beginning in late April. These will contain the yearly updated pages for the Loon Ranger Manual, the maps and Lake Report Form to record the information gathered throughout the season. These reports, returned to us in the Fall, help us to know how better to protect and help our loons. So please remember to return your reports, even if no loons were seen on your lake, and/or if no nesting took place or chicks were seen. Thank you, Loon Rangers! MLPA-MLW is a broad-spectrum group with one narrow objective: to protect the loons. But the implementation of protecting loons covers a wide variety of research, management, monitoring, organization and education. No one narrow activity would be able to address problems ranging from lead and mercury poisoning, mile-long gill nets, habitat destruction of their prey base, harassment by boaters and jet-skis, nest disturbance and destruction and hundreds of other problems which have been identified through years of research and data collection by Michigan Loonwatch, its Loon Rangers and its research projects. These are among the many issues that MLPA and MLW are there to address, with the help of state and federal agencies, Michigan’s citizens, and concerned others as we work together for the success of our beautiful loons and their young, for the present and for the future. Loon protection is a complex effort, and requires so much more than it would seem. There is much to be coordinated, so much to be aware of, so much to learn as we go along day to day. But, most of all, we realize that it is not an isolated effort, but it takes cooperative outreach among those who have the concern and the processes in place to work toward this worthy goal. 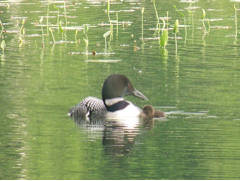 Combining and coordinating our efforts is the key to the success of the common desire that we all share: the success of the loons and their young on our beautiful Michigan lakes. There are many groups in our state that work toward this common goal, and MLPA-MLW is part of this network. It is a good thing to be able to share our concentrations, methods and outreach; to combine our work in the different ways that we approach this important and vital task of helping to ensure that our loons will thrive and continue to make Michigan lakes their territorial home. Would You Like to Help Save Michigan’s Loons? Here are Some Good Ways to Begin! 7. Invite friends and family to visit our sites: michiganloons.com, michiganloons.org and michiganloonwatch.blogspot.com. Encourage them to join the Michigan Loon Preservation Association to ensure that the Common Loon continues to return to our northern lakes. Upcoming Events: Visit us at these great yearly Michigan events to learn more about loons and to shop our Loon Mercantile in person! The Michigan Loon Preservation Association is a non-profit organization whose mission is to preserve the Common Loon as a breeding bird in Michigan through public education, research and the protection and management of loons and their habitat.